When carpenter and sawmill operator James W. Marshall discovered gold at Sutter’s Mill in Coloma, California onÂ January 24th 1848, he set into motion a series of events that would change the economy of that state forever. 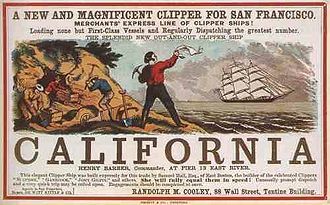 Almost overnight, 300,000 people descended upon California from the rest of the United States and beyond in order to try their chances at mining for gold. San Francisco went from a sleepy coastal town of less than 500 residents to a booming bay-side metropolis with a population of 36,000 as a result of this mass migration. Ever since, California has been the â€œGoldenâ€ state most associated with new-found wealth and prosperity. But it’s quite the misnomer to believe that California gold made thousands upon thousands of Americans wealthy. The truth is that by the time that hundreds of thousands of individuals had emigrated out west in search of gold, the majority of the precious metal had already been mined from the Earth. News traveled much slower in those days and those closer to the action had a clear advantage. Several hundred people did indeed make it rich through the discovery of California gold, but this small number is nominal compared to the hundreds of thousands who never saw one spec of gold in their pans. Lessons in entrepreneurship, it would therefore seem, cannot be directly mined from the success stories of the gold miners themselves. Luck had an almost overpowering influence in their fortunes, and the ingenuity and economical expertise most associated with entrepreneurs was not entirely demonstrated. Instead, attention should be paid to the individuals who saw opportunity not in the gold, but the gold rush itself. Many men came to California looking for gold, but saw thousands upon thousands of people instead. One such individual was a fellow who went by the name of Levi Strauss, a German-Jewish immigrant living in San Francisco who saw opportunity in the durable denim pants designed by Nevada tailor Jacob Davis. Together they made a fortune selling jeans to gold prospectors throughout California. Countless goods sellers made their profits in similar ways. One such merchant wasÂ Samuel Brannan, a New York City native and practicing Mormon who initially sailed to the western coast in hopes of finding a safe place to practice his faith. Instead he and his family realized that San Francisco was a store owner’s dream due to the gold seekers in town, and quickly set up shop. Over the course of the gold rush his business would make profits in excess of $5,000 â€“ over $120,000 in today’s dollars. Modern entrepreneurs couldn’t get a clearer message: it’s smart to sell pick axes during a gold rush. Instead of starting a risky online enterprise like so many people are these days, build aÂ web hosting reviews website for such people to consult. Don’t just brainstorm for green business ideas, but instead start a business that focuses on helping entrepreneurs achieve such a goal. American entrepreneurship calls for seeing the opportunities that are abundant when lots of people gather together all at once. If you find yourself drowning amidst fierce competition, then figure out a way to turn them into a market.